Dogs come in all shapes and all sizes, but their food doesn’t have to. Multiple dogs and growing puppies can make mealtimes complicated. 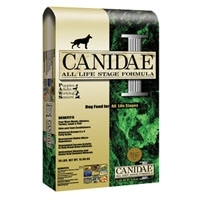 With this CANIDAE® Life Stages All Life Stages formula mealtimes are easy—even for multiple dog households. High quality meat and fish meals, delicious flavor, and our scientifically formulated nutrient-rich recipe make this food a great choice for every canine in your family.